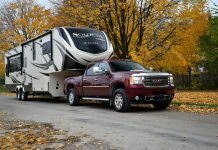 For RV enthusiasts, one of the advantages of owning a pickup truck is the freedom to select three types of RV alternatives – you can hitch up to a travel trailer, go for the gusto with a fifth wheel, or slide a truck camper into the load bed for the most compact and maneuverable RV camping experience. 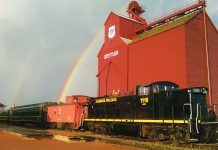 The payload, or GVWR (gross vehicle weight rating) and GAWR (gross axle weight rating) of your truck will determine how elaborate a truck camper you can carry – this information is found in the owner’s manual, and on a label attached to the chassis just inside the driver’s door. The truck camper can provide the ideal combination of comfort, convenience, and mobility for up to six people. 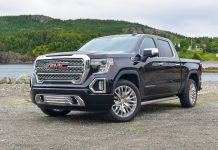 When combined with a 4×4 pickup, you can literally camp anywhere that the truck can go… the only difference is the height clearance and weight distribution of the combination, which will change the handling characteristics of the truck. 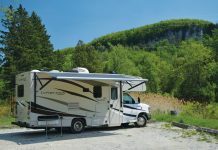 You can still tackle some pretty rough roads, but you will want to drive more carefully with the camper on board, and, of course, always be sure that the camper is securely “tied down” to the truck with the appropriate fasteners. 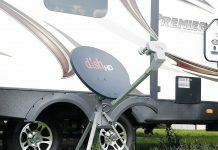 Your RV dealer will assist you with the accessories and techniques that you will need to mount and remove the camper. On our recent trip to the RVIA trade show in Louisville, KY, we had the opportunity to check out the 2011 Adventurer 910FBS – the largest nine-foot model in the company’s line, designed to fit long-bed trucks. 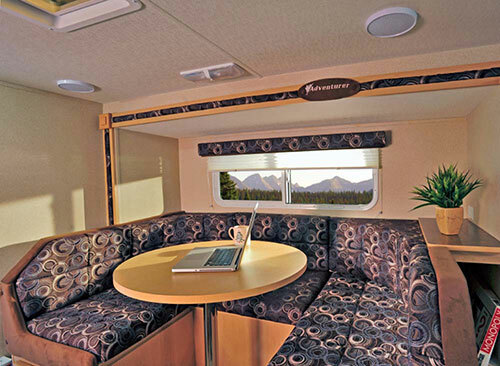 This model features a dinette slide-out that substantially increases the interior space in the camper. An optional in-slide fold-down bunk bed with 125 pound capacity makes this an ideal choice for a family of five. 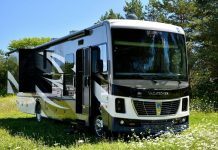 The interior is bright and comfortable, with lots of storage space – there is a deep roll-out storage drawer under the dinette, and an under-floor storage compartment that can accommodate items up to 80” long. 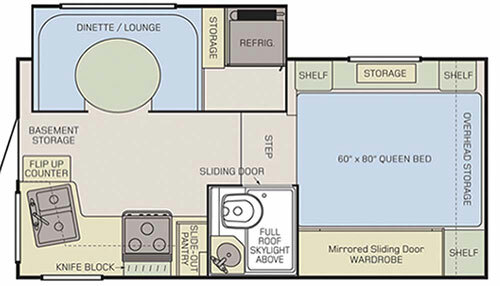 The bedroom at the front of the 910FBS features a 60” x 80” queen bed, with residential type innerspring mattress, surrounded by storage compartments. A double-mirrored wardrobe on the passenger side of the camper provides a generous amount of hanging closet space. Flooring and solid shaker-style maple cabinet doors and drawer fronts highlight your choice of three décor packages. 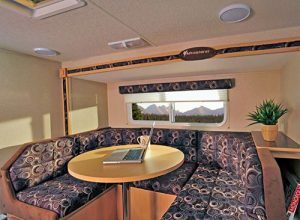 Window treatments with pleated pulldown shades, designer coordinated bedspread and pillows, and the tasteful interior make this camper a very attractive home away from home. 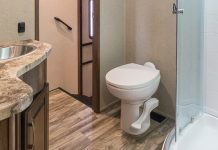 It is obvious that this unit has been designed by experienced campers – everything is exactly where it should be – no features are missing, and all of the latest technical and convenience advances are either standard or optional. The galley in the 910FBS is compact but fully equipped. The u-shaped dinette is spacious for up to four adults, and the swivel table makes access very easy. An optional in-slide fold-down bunk is available. 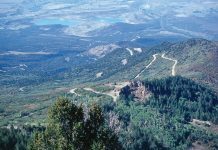 With the mobility of a truck camper, many families find that the ideal trip takes them to the backcountry, and the ability to be self-sufficient is a major advantage. 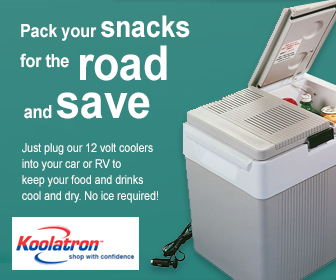 The Adventurer is designed for dry camping, and it has a special compartment to accommodate an optional Onan generator. 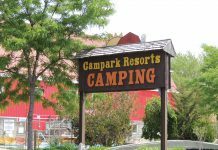 Entertaining the family is a pleasure in this camper, with standard and optional equipment to suit your needs. An optional 15” LCD Flat Screen 12- Volt TV with Triple Pivot Arm can be mounted in the bedroom, and it is designed to swing around for easy viewing from the lounge. 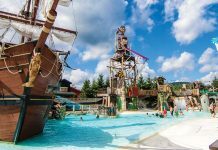 An optional AM/FM/CD/DVD/MP3 Sirius ready entertainment system manufactured by MB Quart®, a leading German audio/visual supplier, can be installed in selected Adventurer models. This component has been designed to handle hard bumps and moist environments typical of marine and camping travel conditions. The 910FBS has a fully-equipped galley with oversize and rugged acrylic sink, easy clean sealed burner range and oven, and adjustable shelf slide-out pantry. 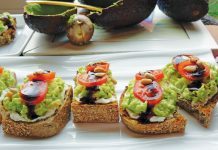 A flip-up counter extension increases your food preparation space. 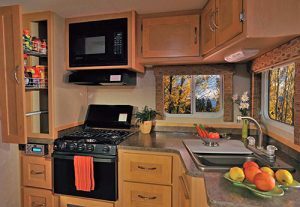 The refrigerator/freezer combination is placed beside the dinette to balance the weight of the unit, and this contributes to ease of movement throughout the camper – you don’t block anything when you open the refrigerator door. The u-shaped dinette and oval table can easily accommodate four people, and the open floor space provides more than enough room for a free-standing chair. The table slides and swivels into position for easier access to the seating area. The Adventurer truck campers feature a welded aluminum tube or wood frame between an outer fibreglass shell and an inner laminated panel. Solid styrofoam insulation assures all-season comfort, sound dampening, and structural strength. Exterior walls have composite fibreglass skins for durability and easy maintenance. Flush-frame safety glass radius windows with gusseted corners are used on most models, with Solar reflective glazing on most models, to provide privacy and reflect UV rays. This adds to the thermal efficiency of the unit. Reflectic insulation and ducted heating protects your holding tanks from cold weather. For winter camping, whenever the furnace is on, your tanks are protected. 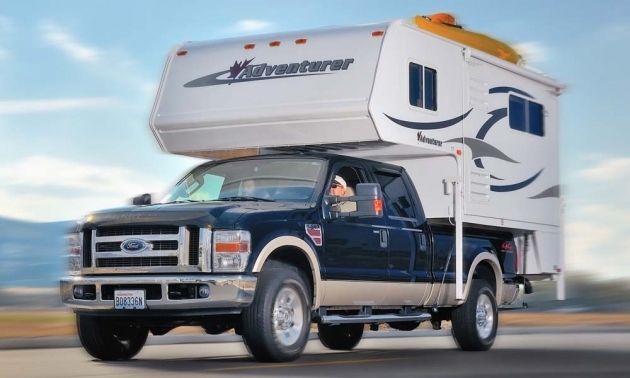 One of the most important aspects of a truck camper is the system that allows you to install and remove the camper from the truck – Adventurer uses the Happi-Jac® camper jack system to provide more than 34” of lift. 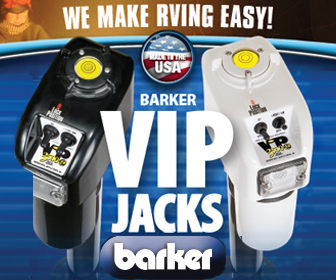 The Happi- Jac® screw jack safely and easily raises and lowers the camper. The unique concave footpad design reduces movement and offers improved stability compared to convex footpads. The front jacks are completely bolted through the wall corners to achieve a strong and stable platform. Above your head, the fully framed composite panel roof is fully load bearing and walkable. A one-piece roof membrane with a 12-year limited warranty is standard. Molded fibreglass front caps are standard on all TCC®-Aluminum constructed campers, providing aerodynamic advantages as well as styling. 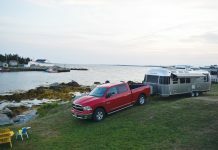 Adventurer truck campers are covered by the manufacturer’s 36 months warranty, with components and accessories covered by their individual manufacturer’s warranties. 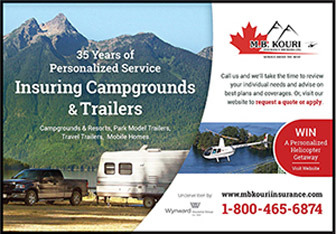 Owners requiring service on the road can visit any reputable RV dealership, and contact the manufacturer to arrange for the appropriate service.